Time for another festive guest post! 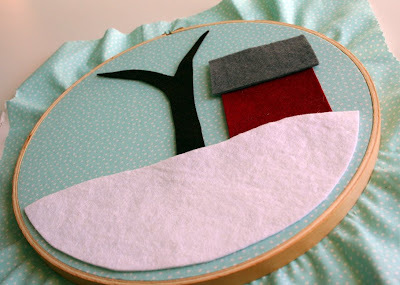 Today's project is a tutorial for a winter scene made from felt, fabric and an embroidery hoop, designed by Melissa of Little Pink House. Hi! 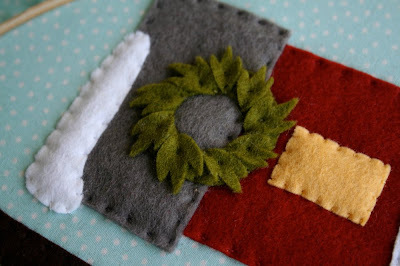 My name is Melissa Crowe, and I blog as "Checkout Girl", sharing my felt-applique work, along with bits and pieces about my life as an artist, teacher, and home-schooling mom. I sell my felty wares at Little Pink House on Etsy. Stretch your background fabric (I've used this polka-dotted robin's egg blue cotton for a clever snow effect, but you can use whatever you like!) 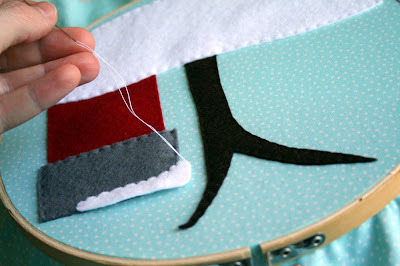 on your hoop, tightening and pulling gently until you achieve a nice, tight, drum-like effect. 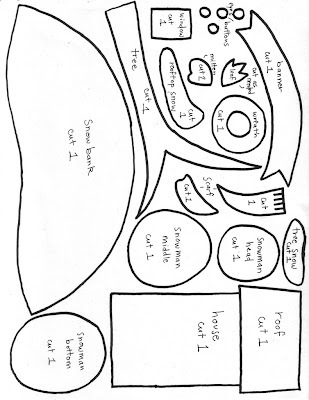 Print and cut the templates and pin to appropriate felt colors (or trace around the template for teensy bits). Cut all your pieces, and arrange tree, house, roof, and snow bank without pinning in order to determine the appropriate position for tree and house. 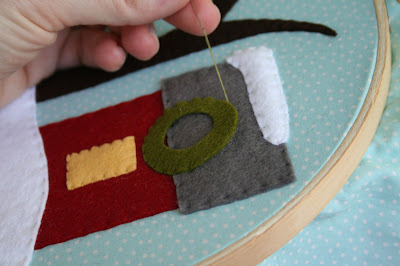 Pin the tree and the house, and attach with a small, neat running stitch. 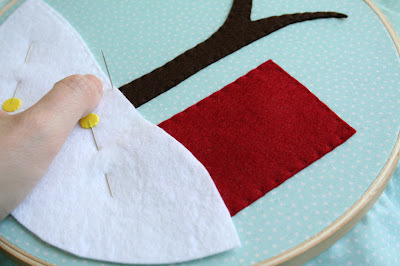 Pin the snow bank in place, overlapping the bottom of the tree and the house, and attach with a small, neat running stitch. 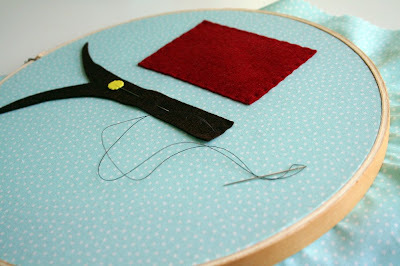 Attach the roof top with a running stitch. 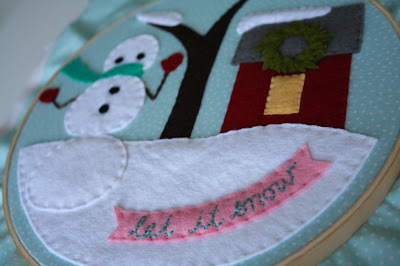 Use a small whipstitch to attach the rooftop snow at the top left corner. 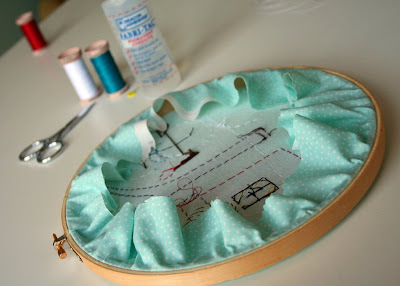 Attach the window in the center of the house with a whipstitch. 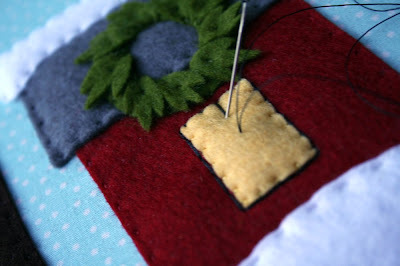 Position the wreath base at the bottom of the roof, slightly overlapping the house, and attach with a small whipstitch at the outer edge only. 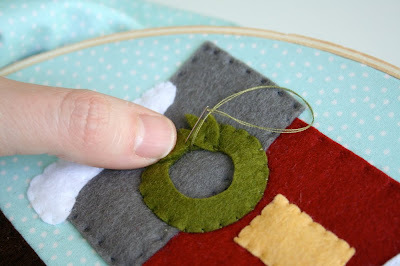 Using two small stitches for each, attach the leaves to the wreath base, lining up the inner edge of each leaf with the inner edge of the base. You can tuck each successive leaf between the wreath-base edge and the previous leaf's edge. 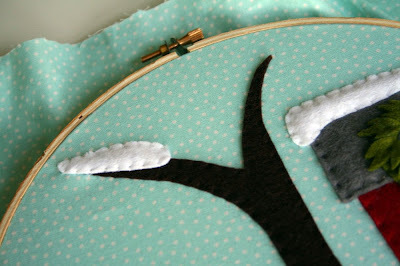 Attach the tree snow to the left branch of the tree with a small whipstitch. 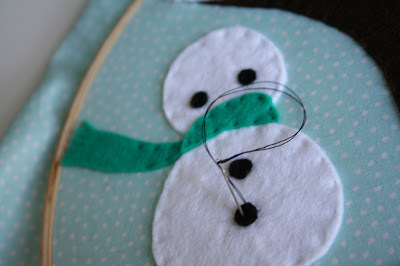 Insert the side piece of the scarf into the space between the snowman's head and his middle, and attach with a few stitches. Then position the neck piece and attach with a running stitch all around the edge. 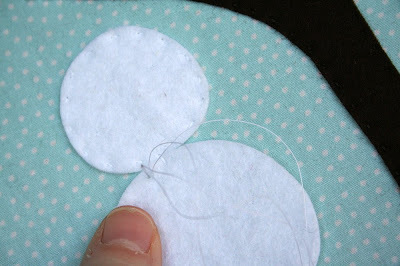 Using brown embroidery floss (all strands), make arms with two side-by-side rows of backstitches. The position of the arms is totally up to you! 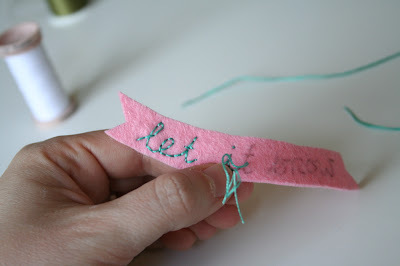 At the end of each arm, attach a mitten, using a running stitch. 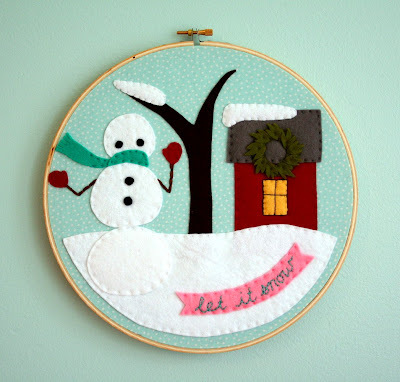 Use a sharp pencil to mark "let it snow" (or any winter greeting you like) on the banner, and trace the letters with a small, neat backstitch in turquoise floss (two or three strands). 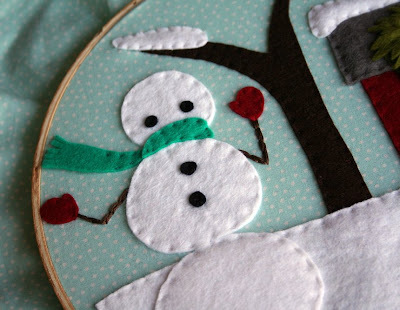 Use a running stitch to attach the banner to the snow bank. Use a doubled strand of black thread or floss and a backstitch to outline the window and create a t-shaped crosspiece inside the window. The hard part is over! Now to neaten the back, trim away some of the excess fabric, and run a bead of glue (almost any kind you have will do) around the inner hoop. 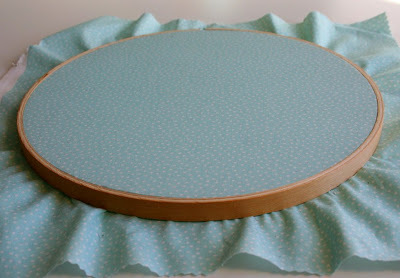 Now fold the fabric down all the way around the hoop, pressing with your thumbs and fingers until the glue takes hold of the fabric. Tah Dah! Let this little man welcome your holiday guests this year! 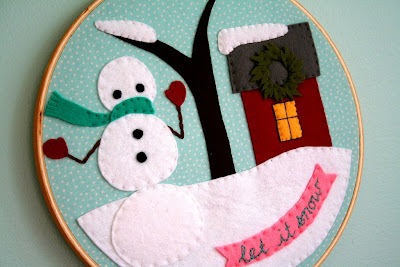 Visit Melissa's blog for more tutorials and to see more of her gorgeous felt designs. I love this, hope I have enough time to fit in one of these before Christmas!! it's beautiful !thank you very much for the tuto ! So charming! 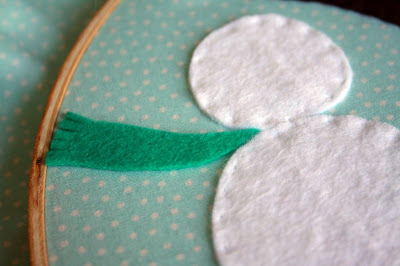 I miss working with felt...used to do a lot of that for a small business ages ago! Oh my goodness, this is absolutely beautiful - as is the rest of your work! This seems like a perfect project to sit with in front of the TV and who wouldn't be thrilled to get this for a gift?! I am definitely going to have to make several of them! Thank you so much for sharing! !